SOMERVILLE, MA: In a pivotal game critical to the team’s playoffs hope, the Chicago Force (6-1) delivered in a big way with a dominating 58-14 win over the Boston Renegades, moving the Force into the #2 seed in the eastern conference. Boston (5-2) had two early scores and led 14-6 at the end of the first quarter but Chicago took control from there with three unanswered touchdowns and went into halftime with a commanding 30-14 lead. Boston quarterback Allison Cahill was injured just before halftime on a thunderous sack by Darcy Leslie and did not return to the field. Cahill took with her any hopes Boston had of climbing back into the game. 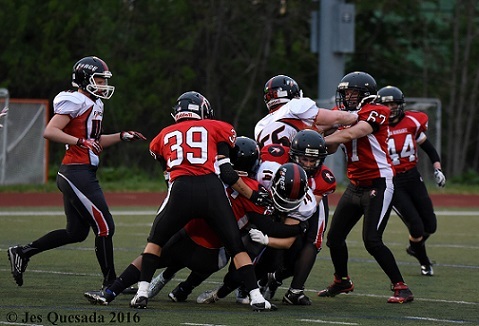 Chicago continued to expand their lead with four more unanswered TD’s in the second half including an interception returned for a touchdown by Nicole Matheson. The Force had a tremendous performance from their revamped offensive line with Cat Converse, Daniela Stosic, Jamie Menzyk, Tracy Day, Tami Engelman and Leeann Bluske opening large running lanes for the rushing attack. Chicago quarterback Rasan Gore led with 178 rushing yards and 5 TD’s while also throwing for 208 yards and a TD. The lone passing touchdown came on a 53 yard completion to Tamika Robinson who finished with 4 catches for 84 yards. Jeanette Gray had 8 receptions for 78 yards and Jamie Fornal had 46 receiving yards and also had a 14 yard TD run. Chicago defensive standout Elisha Okrey pitched in on offense and had 10 carries for 57 yards. With several starters missing, many Force players were serving double duty and playing on both sides of the ball including Menzyk, Day, Engelman, Leslie, Fornal, Robinson and Kelsey Casey. The defense shut out the Renegades after the first quarter, securing 5 turnovers along the way – two interceptions (Matheson and Jill Airaki) and three fumble recoveries. Linebacker Leslie led the defensive charge with 9 tackles. Defensive end Angel Smith continued her dominant play with 6 tackles, 5 tackles for a loss, 3 sacks and she also forced and recovered a fumble. The defense limited Boston to just 186 yards of total offense. The Force host the final game of the regular season on Saturday June 4th vs the Pittsburgh Passion at Lane Tech High School. Kickoff is at 5pm and this is also Alumni Day with festivities starting at the pre-game tailgate.